“If an award is given for most ambitious band of the year, Sian Alice Group will no doubt be in the running to take the prize.” - Exclaim! Finally. A remix record of unfettered diversity adds yet another element to an indefinable band. 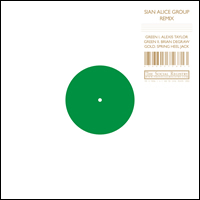 Remix – the new EP from Sian Alice Group – takes the material from their debut album 59.59 in a new stunning direction. A who’s who of music circa now magnifies fractured gems in the group’s tracks and reappropriates these moments into truly avant-garde explorations. With tracks named after the remixers, “Alexis Taylor” takes 59.59 opener “As The Morning Light” and focuses on the silky qualities of Sian Ahern’s voice. The Hot Chip member emulates Ahern’s style, collaborating with band member and multi-instrumentalist Rupert Clervaux to create another take on the torch song qualities of this stunning track. “Brian Degraw” brings remix concepts to extreme heights with the Gang Gang Dance member’s take on “Murder.” The long exploration represents something akin to Gang Gang Dance’s Retina Riddim soundtrack – painstaking drum programming, soaring electronics and extreme vocal manipulation are slathered with a healthy dose of attention deficit disorder composition to create one of the more warped pieces of house music ever put to wax. This one is sure to blow many a mind. “Spring Heel Jack” hones (and when we say hones, we mean HONES) in on the main riff in “Way Down To Heaven.” Focusing on essentially two notes, two drum hits and ear-blistering volume, Ashley Wales and John Coxon present a minimalist scenario that sounds somewhat akin to Terry Riley jamming with the Velvet Underground. Turn the track way up, lock in your headphones and revel in the trance of expertly executed subtle variation. Another perfect companion.